I could claim that “Last Days of the Arctic” by Ragnar “Rax” Axelsson doesn’t count, because (a) it isn’t about Iceland as such, and (b) I bought it from Amazon because it was too heavy to carry. Not to mention costing half the price. Then again I did order it whilst in Iceland. Let’s say it’s a borderline case. However, for “Rauðisandur”, by Rut Hallgrímsdóttir, I have no such excuse. I was snagged by it at the deadly trap of the Eymundsson bookstore at Keflavik airport, and with a few thousand kronur left in my pocket it was a foregone conclusion. So why did I fall for it ? Well, “Rauðisandur” is different. So far, a very large majority of Iceland landscape photo books are generic. Basically they take the wide view, and take you all around the island. Different photographers have different approaches, but by and large they’re still working in the first generation of “serious” icelandic landscape photography books, which as far as I can tell only really got going around the start of the century. It’s a young market, and although it is beginning to mature, I’d say it isn’t saturated - yet. But it’s edging that way. So, it was interesting to see what could be a precursor of the next stage, a book with taking a deeper approach to a (much) smaller area. This has been done before, in a way, but more as hybrid trail guide / photo books, such as Daniel Bergmann’s “Skaftafell National Park”, and even that seems to be a rare exception. As far as I can tell, Rut Hallgrímsdóttir is a professional photographer living and working in Reykjavik, specialising in formal portraiture, so this is not a typical project from her. Rauðisandur, an area in the extreme West of Iceland, on the South-Western edge of the Westfjords, is an area she discovered through her husband. It’s an area well known for its vast, sweeping sandy beaches, a bit reminiscent of the Irish northwest coast, but little visited due to being really well off the beaten track. Although it has a rich and fascinating past, Rauðisandur is largely deserted these days. The (relatively) rich farming lands are not much of an attraction compared to the (ahem) riches of Reykjavik, and the old farms are derelict and fading. This is the natural and human landscape that Rut sets out to capture, and in my opinion she does it very well. To be clear, this is not classic landscape photography. While there are some decent shots in the book, and some of the seascapes are excellent, they’re not really in tune with the modern landscape ethos. Indeed, I get the feeling that more than a few were shot quite some time ago ... on film!! There are no technical details in the book, not that I care at all, so I’m just guessing. What the photography does do very well though is to convey an intimate connection with this small, faraway - but still quite awe-inspiring - corner of Iceland. The commentary is full of fascinating anecdotes, and spent ages getting drawn into the stories about the farm at Vellir, and the photos of the surrounding landscape. The book also include a nice section at the end on the area’s history by local expert Ari Ívarsson. The photography is largely split between wide angle landscape vistas and semi-abstract close-up rock, wave and beach details. Again, it’s a combination that works well in conveying a sense of closeness to the land, and the more abstract work adds a considerable touch of artistic weight to the book, which otherwise might end feeling a bit bland. It’s through these abstractions that I feel we get a glimpse of Rut’s true skill as a photographer. It would be interesting to see more of these. 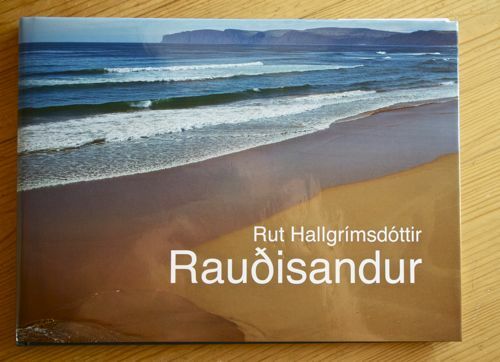 I guess “Rauðisandur” isn’t going to win any major prizes: it’s not that kind of book. But in its own quiet way it’s a very interesting and worthwhile book, which might leave a more lasting impression than just getting Lost in Iceland. APOLOGY: The following shots are, I’m afraid, very poor quality. I’m not really set up for product shots (i.e too lazy too bother…). But they should give a rough idea of the book’s direction. the widest collection in the world?